\pgfresetboundingbox is undefined control sequence? I'm sure this question has a simple answer that I'm missing: I'm trying to use pgfplots to put two graphs right next to each other with no space in between. I thought I could do this by using the \pgfresetboundingbox command found in the manual. However, LaTeX gives me an undefined control sequence error on this command. What am I doing wrong? 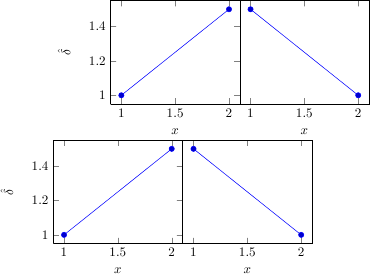 Include the axes in the same tikzpicture and place them using the axis nodes south east and south west, which lie on the corners of the axes. Reset the bounding box as you suggested (probably after updating your pgf), then set the axis as the new bounding box.